ISLAMABAD: The Foreign Office (FO) on Thursday said that peaceful political settlement and stability in Afghanistan was a shared purpose of Pakistan and the United States. 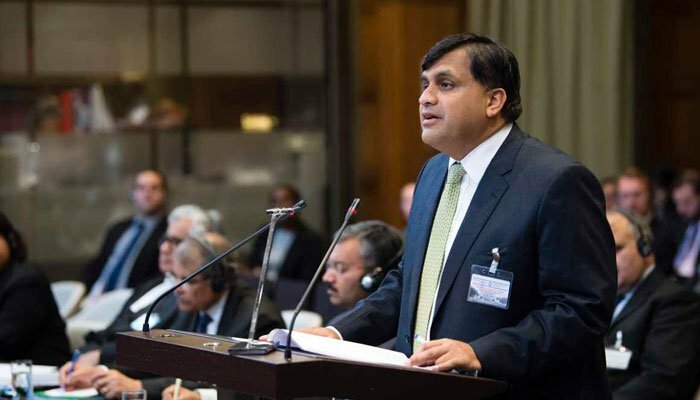 During a weekly press briefing, FO Spokesperson Dr Muhammad Faisal said that Pakistan was the only country in the region that had actually taken counter-terrorism measures for regional stability. “Pakistan is committed to supporting the efforts leading towards peace, whether from USA or Afghanistan,” he added. He said that both Pakistan and US were working together towards stability in the region and truly believed that an Afghan-owned political government was the solution of Afghan issue. Regarding the presence of ISIS in Afghanistan, he said that Afghan authorities had assured their complete assistance in the matter. Dr Faisal went on to say that Pakistan wanted to avoid any confrontation with India, adding that, however, its armed forces were fully prepared to respond to any retaliation. “Indian brutalities and gross human rights violations in occupied Kashmir continue unabated and with impunity. The Indian occupation forces killed eight Kashmiri youths in Shopian, Pulwama and Hajin areas,” he said. The spokesperson said that Pakistan kept raising its voice to point out Indian hypocrisy in occupied Kashmir. “We urge the international community to pay due attention to the matter and hold India accountable for its crimes against humanity in Indian occupied Kashmir,” he said. Replying to another query about the Syrian conflict, he said that Pakistan urged a peaceful settlement of the issues with respect to Syrian boundaries. However, he added that medical assistance, food and shelter must be provided to the displaced innocent men, women and children in Syria. “It is important to have human solidarity,” he added. Dr Faisal said that Pakistan and Afghanistan had a history of mutual trading. He added that Pakistan was opening new points for trade routes from Afghanistan. “With the opening of the Pak-Afghan Ghulam Khan border in March, there will be four routes through which the trade will be conducted with Afghanistan,” he informed. Answering a question about Pakistanis living in Saudi Arabia, Dr Faisal said that “our foreign missions in Jeddah were working together to facilitate the Pakistani diasporas there”. “Our embassies in Riyadh and Jeddah are ensuring the well-being of Pakistanis at every possible level. Saudi Arabia has always extended its full support, and around 300-350 visas are issued monthly to Pakistanis intending to go there,” he told. About SAARC summit, he said that being a strong member of SAARC, it depended on India’s willingness. He further said that Pakistan strongly condemned the brutal killings of innocent Kashmiris and the detention, yet again, of JKLF Chairman Yasin Malik for leading a peaceful protest on the fateful killings of innocent people in Jammu Kashmir last week. NSA JANJUA SAYS NEED TO STRENGTHEN BILATERAL TRUST: Meanwhile, National Security Adviser Nasser Khan Janjua said that Pakistan considers Afghanistan as a brother and believes that both the countries share a common future. He said the two countries should march towards peace together to stabilise the region. The delegation appreciated the positive approach of Pakistan towards Afghanistan and awarding scholarships to the Afghan students. The Afghan student discussed different problems they are faced with while studying in Pakistan. Upon which, he assured the students that their concerns will be addressed by the relevant authorities. Helping the very same people that demonized us Muslims (USA, attacking Muslim countries, caught funding terrorists and later on blaming the Governments and killing the locals calling it collateral damage), we are hated, made fun of and discriminated against in the West (and these guys claim to be the good guys). Yet, they don’t know the biggest victims of terrorism are the people in those countries being attacked by terrorists and when such innocent people go for asylum they are treated badly, used a tool for political motives and shown in bad light. Give me a break, seriously, what sense of justice does this world have? Pakistani Government is being run by fools. Cut ties with USA and shift to China and other countries, instead of allying with warmongering nations ally with those that help develop, build and heal nations, not break them and cause turmoil. Also, shame on us Muslims for even thinking of seeking asylum in Western nations. They show us as scum and we’re shameless enough to want to go there, work for them and pay taxes in their countries as citizens. Yeah, I guess if we won’t change we deserve the hind-kicking. If most of you haven’t known, there was an incident in Ireland called the Great Famine, they were suffering so we as people with good hearts donated to them in between 1845-1849, during the Great Famine in Ireland, the Ottoman Empire sent £1,000 sterling (about $1,052,000 today) and 3 shiploads of food to Drogheda, Ireland. Yet, nowadays, when there’s trouble in the Muslim world they look the other way and commit heinous acts upon Muslims. Pakistan needs to stop begging with that kashkol and man-up, with an ounce of dignity have some shame to raise questions and analyze the real issue. They haven’t even admitted any Europe located Muslim country in the European Union, most of them remain outside it, while they integrate other countries who are way more younger too. They have Turkish people as canon-fodder in the NATO forces in front-lines so these sack of meat and die first. Yeah, that’s how they see us, not as human beings. To hell with USA (claims to be the good guy, more like Satan). Documents declassified by CIA explicitly mention that the American intelligence was aware of the occupation going on in Palestine, they included a map showing the process and the increase in territory even mentioning most of the Jews being dual nationals and powerful people. Yet, they didn’t even question the ethics behind such occupation of Palestinian territory. Shame on incompetent leadership in Muslim world, not questioning such activities at all. VICE made a documentary on Syrian refugees in Greece and what’s happening to them, it’s sickening. Sorry not VICE, RT Documentary made a video on them. Or what’s happening in Myanmar and guess who sold them Fighter jets. And we won’t even talk about the other thing.